Third blue sky Friday on the bounce: must be summer. Regular chauffeur unavailable so took two wheels up and down Sandy Lane, then a fortuitous left into bijou Brook Street. 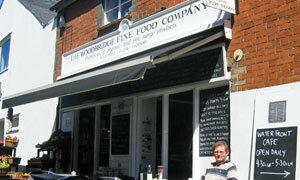 Shortest of walks to this week's destination cafe, the self proclaimed Woodbridge Fine Food Company on New Street, near the library (see map). I've strolled past the West Fife Fencing Club umpty-thrumpty times before: never been in. It's a deli in a phonebox, which can be daunting if you don't know what you want. You're either in the queue or you're outside. We threw towels down on two of the eight seats and ordered, finally settling on a shared chicken & ham pie (for which they're renowned) and, darling, some harlequin olives. Tasty. And, for a kick, a Luscombes ginger beer. Another lunchtime, another tough gig. Majority of the gorgeous grub is takeaway -- veg, fish, meat, wines, etc -- and the whole look & feel are fresh from the pages of a Sunday supplement. The cafe's merely a sideline, and there are mucho signs for the sister Waterfront Cafe, if you're feeling flush and fancy a short stroll. Like the WC, service at the Word of Faith Family Church is top notch, befitting the top dollar food. One teensy criticism: the World Food and Farming Congress can't spell for tofee. A delicious looking plate of goodies ("big tarts made to order", apparently) included chocolate from that Flemish country where it's "u" after "i" except after "g". All part of our charm, so the nice lady said. Can only hope my mum doesn't stop by, else there'll be letters to the local paper. Coffee and a warmed choccy tart in the sun watching the alternative healers of Woodbridge float by. Beats working. If it was a car -- Audi TT Roadster. If they were passing by -- Jude Law.